A custom recovery based on ClockworkMod has been released for the Amazon Fire TV by the very talented rbox. ClockworkMod recovery allows you to perform several advanced recovery, backup, restoration, installation and maintenance operations on your Fire TV that isn’t possible with the stock recovery. This is a landmark moment and a huge step towards the development of custom ROMs, kernels, themes, and more. Read on for the full guide to installing this custom recovery. Your Fire TV must be rooted to install this custom recovery. Your Fire TV also needs to be running software version 51.1.0.2_user_510058520, 51.1.0.1_user_510055620, or 51.1.0_user_510047320. If it is not, then you will need to downgrade your Fire TV to version 51.1.0.2_user_510058520, but you can upgrade back up once the custom recovery is installed. Your settings and user data should remain intact through this process, but it’s always a good idea to backup anything you don’t want to lose, like your XBMC settings. Also, if you’ve blocked updates via the “pm disable com.amazon.dcp” method, updates will stay blocked after the downgrade, so no need to worry about your Fire TV accidentally updating itself. Important: If you are setting up a new Fire TV, you should visit the Starters Guide if you haven’t done so yet. This is a very old and outdated guide. Do not follow this guide with a Fire OS 5 device or with a TWRP device. Check the software version on your Fire TV by going to Settings > System > About. If your Fire TV is on version 51.1.0.2_user_510058520, 51.1.0.1_user_510055620, or 51.1.0_user_510047320 you do not need to downgrade, so skip to step 5. Otherwise, continue to step 2. Downgrading removes root, so you will now need to re-root your Fire TV. Follow my guide to unlock your Fire TV bootloader. You can ignore the “Important” part about downgrading and skip straight to step 1 of the guide since you’ve already met the downgrading requirement by following the previous 4 steps in this guide. ClockworkMod recovery should now be installed. You need to connect a keyboard to the Fire TV’s USB port to control ClockworkMod. Do so before booting into ClockworkMod because it won’t detect a keyboard being plugged in while it’s already booted. ClockworkMod cannot be controlled using the Fire TV remote. Alternatively, you can control ClockworkMod over the network by following this guide. After the Fire TV reboots, if you see the below screen then you’ve installed ClockworkMod successfully and you’re done. Select “reboot system now” to boot back into the main Fire TV OS. Now you’ll probably want to either continue with the starters guide or install a custom ROM. Note: You can press the 1 and 2 keys on the connected keyboard to adjust the display scaling if the menu is cutoff. Now go donate to rbox! He has put in a tremendous amount of time and work to make this all possible. Great work! rbox is a genius! I followed this guide and have my AFTV with clockwork recovery. Waiting for a guide to backup files and update with pre-rooted image. Believe you need to add the steps of adb kill-server, adb start-server, and adb connect IP Address between steps 4 and 5 right? thanks for the guide. I cannot seem to get my aftv to enter recovery mode, it just hangs at the white amazon logo. A power cycle boots normally, but no CWM. Any suggestions? Hanging on the white Amazon log usually means your Fire TV is in fastboot mode. This happens when the Fire TV is receiving power from the USB port. Are you using a powered hub or other kind of USB splitter that may be providing power back to the Fire TV? I did have a powered USB hub attached. I removed it, but still cannot get into recovery. aftv just hangs at the amazon logo. a power cycle boots to home screen; no CWM. I’m having the same problem with 1 of my boxes. I went back into su app screen and the log says SU pro is required for this feature. never could get back to recovery. recovery partition is hosed. Botched mine as well, but it was user error! Word of warning if you have using a download manager like I am (FDM in my case), it may look like the correct file downloaded, i.e. named correctly and sitting nicely in your download folder, but it’s not correct. I stupidly did a checksum after flashing and realized this. To get the correct file you have to click through you browser from the site it take you to. Quick update.. unplugging my network cable and plugging back in worked in order to adb connect. Box must have lost it’s ip or something. Good news is, with the correctly downloaded recovery file, I re-patched it and it’s working fine and I’m in clockwork. If you had this issue of a white screen, check your img file and make sure it fully downloaded (should be around 8meg). This may seem like pretty obvious stuff, but the fact that I got no error message with my download manager made it look like a complete correct file. Hope that helps someone somewhere. i got hunged by the white logo too, but i do not use any power source..any idea? Will this allow me to do a full backup of one AFTV and restore on another? I have not tested this, but theoretically it should. would like to know if this works too. dont want to brick my other device. You may have forgotten the last / after sdcard. I cannot get into recovery mode. when it reboots after adb reboot recovery i get An error message says the software update was not successful. then it hangs on it for a minute or 2 before it reboots again into the fire tv. i am on version 5850 and i am rooted. It sounds like you haven’t installed ClockworkMod correctly (step 10). Ensure steps 8, 9, and 10 are being done correctly without any errors being reported by ADB. Remember, step 9 will cause a prompt on the Fire TV to grant access if you’ve never allowed the ‘su’ command before. After you type “su” and hit enter, the character before the cursor should change from a “$” to a “#”. That’s how you know you have permission. It wont hurt anything to retry the whole process again. I successfully did this on another AFTV. This is the second one I am trying it on. Repeated the process a second time after the first didn’t work. Still no luck, just the white amazon logo and flashing white led when attempting to bood into recovery mode. That looks correct. The comment above this one was wrong because the different commands got mixed together on one line. When you do the last step (adb reboot recovery), it’s normal for the cursor to just flash because the Fire TV is restarting so your PC has lost connection with it. Nothing is supposed to appear in your command prompt after the last step. Your Fire TV should restart into ClockworkMod. That means ClockworkMod has not been installed. Double check everything. Check that your FIre TV in running 51.1.0.2_user_510058520, 51.1.0.1_user_510055620, or 51.1.0_user_510047320. Check that you’re rooted. Not much left to try other than factory reseting and trying everything over from the beginning. I’m sorry I can’t be more helpful. I’m currently working on including some screenshots to this guide to better help you know how things should be going. On a stock (unmodified) Fire TV, when you run “adb reboot recovery”, the Fire TV will reboot and display that “Update was not successful” screen. If you’re seeing that screen after running the command “adb reboot recovery”, it means you have not installed ClockworkMod successfully. Something is failing between steps 7 and 10. I just finished adding screenshots of the commands to help. I suggest doing a factory reset, then follow all the commands again. Even if you are on 51.1.0.2 or older, I suggest doing steps 2 thru 5 (the downgrade steps) so that you are on a fresh system install. I installed ClockWorkMod, but I did not downgrade firmware to 51.1.0.2, now I can not downgrade or upgrade to any FW. How do I remove CWM ? After installing ClockworkMod is it safe to remove recover.img in /scared/ ? Thanks for your help, it’s working now. I installed ClockWorkMod but I could not use a keyboard or mouse to utilize it. Running Win7. I tried one mouse and two different keyboards. I also tried using my keyboard through the command prompt. Luckily used the command “reboot” to get out of it. Any ideas? Thanks. Can’t get this working. I have the recovery.img on my c drive but I can’t get to work. No matter how I try I cant get into Clockwork recovery mode. As a last resort I have tried keyboard reboot “alt-print scrn-i” and can see unit reboot 3 times then back to white logo screen. Also right arrow and back button on fire tv remote but can only get orange light at home screen then just restarts. got my fire tv to install recovery and install the latest rooted firmware. i factory reset the device and stopped any updates by removing the lan cable. rooted the aftv and pm disable the device. busy loading all my previous apps and getting all xbmc data to run off the usb external drive on the usb port on my router. I installed it using Amazon FireTV Utility App v0.23. Then tried to update the stock rom 51.1.1.0_user_511070220 instead of the pre-rooted stock rom. Now my firetv keeps in the rebooting status. Is there away i can get out of this mode and back to ‘recovery’ mode? Thanks. i just saw that Gilad asked the same question. Has anyone tried this? Hi sorry if this is a basic question, however can someone let me know if cwm can be simply installed on a rooted firetv using the firetv utility and the appropriate radio button. My problem was that I had the inet cable plugged in and (for some other reason) it was not connecting during initial setup so I used wireless… when I unplugged the cable, the FTV popped into recovery mode. I was able to install cwm and latest rooted stock on my 1st aftv. Did you downgrade to 51.1.0.2 first like the instructions say? I’m in the same boat, my other Fire TV went fine but I’m stuck on this second one. I did not downgrade to 51.1.0.2, I missed that bit. I went through all the other clockwork mod install steps already and it will not enter recovery mode. After that I tried the guide to manually install 51.1.0.2 but again it will not enter recovery mode to complete the install it just hangs at the white amazon logo. I rooted fire tv before but somehow it got update and I am now on 51.1.3.0_user_513011820. Is there any way I can root it again? it seems like without root access I cannot downgrade it nor root it at this time. I have another fire tv which in never rooted and it is on I am now on 51.1.3.0_user_513011820 too. what are my chances to get root access? Is there anyway to do this through the latest version of Fire TV Utility App? Because I keep running into this issue where SuperSU denies me permission if I go through the app’s built in Shell command UI. Are you sure you renamed the correct file recovery.img? Maybe you renamed the wrong file. Ran all the steps but stuck at amazon white logo. When i power cycle FTV opens normally but no recovery. Could not make it work. Rolled back to 6.0.5.1.3 and all is OK. I have the same problem as Ed. Please help. After unlocking the bootloader and installing clockworkmod, I want to do a wipe and then install the custom rom. how should I wipe from clockworkmod? thanks. Just select the factory reset option in clockworkmod. Your guides are awesome, somehow I think I missed something. I’m at adb push c:\recovery /sdcard/ and it says cannot stat….no such file or directory. Everything has worked great until there. What did I miss? I’ve tried the full path as well as C:\recovery /sdcard/ I’m getting the same cannot stat no such file or directory. I’m unlocked and everything seemed fine. I downgraded fine but now i cant push the clockwork mod over. I’ve tried the latest release as well as an older one?? Not sure how I got stuck or where to go?? Is the only way to get into Recovery mode through adb? Clockwork Mod, and the new BootMenu have been successfully installed. If I do “factory reset” (either directly in FTV or from the App), what state will my FTV be in? Rooted? Bootmenu? Factory or Custom ROM? Ha, I just came on to your site and saw that post. THANKS! It does clear things up. Shortly after my question above I went ahead and ‘factory restored’ anyway. Just like you said: I had to re-enable the developer option. I will say that the ‘search for update’ was either non-existent or very short. I have router blocked, and have bootloader. One thing that is really clear now is how updates get installed. I didn’t realize it was only installed on reboot, but CWM will prevent it from being installed on reboot. Can we delete the recovery.img file after we install the custom recovery to free up space? If I delete this recovery.img file on the FireTV with the command you suggested, where does it go? Does it actually free up space, or does it go to some kind of “recycle bin” that also has to be emptied in order to actually reclaim the free space? It frees up space. There is no recycle bin on the Fire TV. BTW, where does ClockWorkMod store its backup files? Which folder location is it in? When I follow directions above and push out 6.0.5.1.4a and try to install it. My AFTV gets stuck on amazon logo. I have to power cycle it and and boots back up normally. If I push out 6.0.5.1.3 and reboot it reboots to clockworks mod recovery. I am not sure what I need to do get 6.0.5.14a installed. If I have 6.0.5.1.3 installed is there a way to upgrade to the latest version right from the clockworks menu? 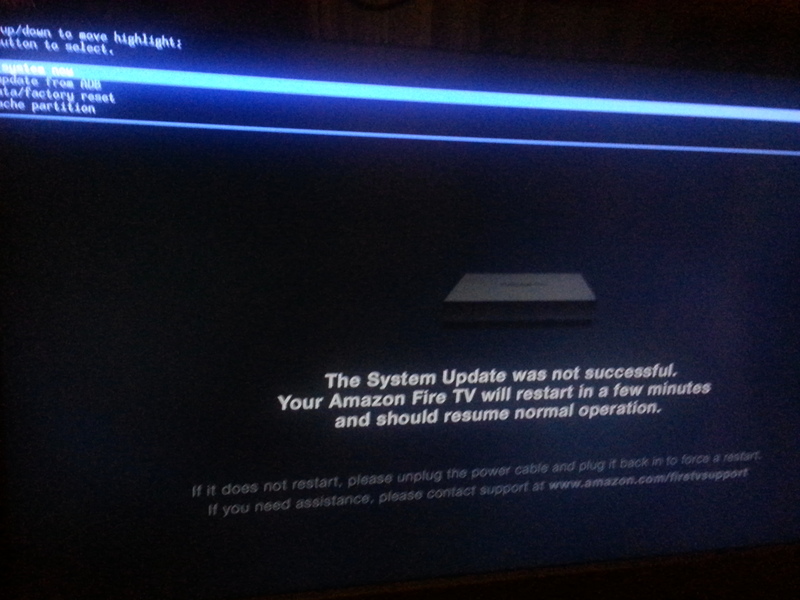 I have a question im root my fire tv im using amazon firetv utility v0.34 every time i reboot into recover or try to reinstall the recovery i get the white amazon logo and a on n off white light! it never goes any father so at this point it seems im not able to install recover or update custom roms. Im running 51.1.2.0 stock still but rooted! Thanks to your guides and the genius of rbox everything worked out great! I ended up using your serial number decoder and purchased two more at best buy! On this second AFTV, there’s a weird issue though. After the AFTV is idle, it will go to the screen saver, then “power down / sleep” as usual. But then, after sleeping for 5 to 10 minutes it will randomly boot into cwm recovery?? Not a huge deal for me, can just reboot system from recovery. But the wife freaks out so I’m trying to make it wife friendly lol. Any ideas on where to look for problems? Any thoughts or ideas are appreciated. Any luck fixing this? I have the same issue on one of mine. back to the 51.1.0.1 version my box came with. After this, I went through the steps through installing Clockwork and it finally booted into the recovery. any fix for “stuck at while Amazon logo?”…. I,m trying to make a backup on a pendrive but i don’t see any option about this. Only it seems possible on the internal Sd. Anybody knows the way to make a backup on a external USB storage ? Can I use 6.0.5.1.3 also? 6.0.5.14a and 6.0.5.14 gave me the white Amazon logo. Followed al the steps correctly and didn’t get any error message. I downgraded and rerooted to firmware 51.1.0.2_user_510058520. I wonder why 6.0.5.1.3 gives me the ClockworMod screen and 6.0.5.1.4a the white logo? I am completely new to all this, my aftv box has been blocked by amazon. I’ve been told that I can install a nut custom OS so as to use the box. My aftv is a 2016 model. I do not see any of the versions you listed as my current version. I am already Rooted on 5.0.4 (536116920). Will the Clockwork Mod still work? Comments have been disabled for this post due to an increase in spam comments.